As urban areas grow, they typically do so within the confines of decades old or centuries old municipal boundaries and structures. Towns, villages and cities grow up to the edges of one another, cities sometimes sweep around bedroom community suburbs, and the result is something that says a lot about history but can be a confusing mishmash for elected officials, administrators and citizens. A case in point is the Greater Victoria urban area on the southern tip of Vancouver Island, British Columbia, Canada. The area that most people just call Victoria is in fact a collection of 13 municipalities and three ‘electoral areas.’ At the core lies the City of Victoria (the capital of British Columbia) itself, surrounded by other urban extensions like Oak Bay, Saanich and Esquimalt as well as further-flung ‘rurban’ communities. The municipalities participate in a regional governance entity called Capital Regional District (CRD). Yet even with the CRD partnership umbrella, people wonder about the oddities of a disjointed urban area and debate the advantages and disadvantages of more formal amalgamation. 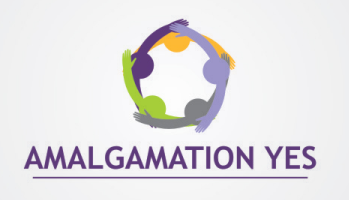 Recently, a citizen-led group called Amalgamation Yes was formed to push the discussion onto the open public agenda. We recently caught up with one of the group’s founders, Susan Jones, for a Q&A session. 1. What are the compelling reasons for amalgamating a group of adjacent urban municipalities like those in Greater Victoria? Here in Greater Victoria, services and infrastructure are currently laid out in accordance with political boundaries, rather than need. This includes important emergency services. For example, in the northern tip of Oak Bay, the nearest Fire Hall is in Saanich, on MacKenzie Ave near the University of Victoria. If these two municipalities amalgamated, residents on both sides of the political boundary could take advantage of the same services. 9-1-1 dispatch times could also be improved, as they wouldn’t have to establish which fire hall is in your municipality, only which one is closest to you. Larger cities have ‘3-1-1’ programs, where you call one number and can access all of the services you need. Instead of calling each department separately if you have issues with garbage collection, bylaw enforcement, or your local park, you just call 3-1-1 and they solve the problem for you. A second reason is to promote better transportation planning and mass transit. Stuck in the Colwood crawl? Ferry traffic messing up your commute to Sidney? There is currently little integrated regional transit planning and less funding to make any plans happen. Amalgamated municipalities with large residential and business tax bases would feel the pressure and have the capacity to get goods and people moving more efficiently. Bike lanes which currently are inconsistently rolled out between municipalities would be better planned and connected, making commutes safer for riders and drivers alike. Third, we want to leave the best possible local governance model to the next generation. For a moment lets look forward 10, 20, 50 years and imagine if we have the current system of 13 municipalities (possibly more?) and the Central Regional District, what kind of community we will be a part of? Will it be efficient? Will it be effective? We have demonstrated just in the past two years the issues we cannot resolve: policing, transportation and sewage. We need a governing system that can evolve, that can sustain 50 years from now; forward thinking, innovative, even visionary local government that has the capacity to sustain a strong local economy, the best parks and environmental planning, and is able to tap into the potential of our local assets (including our colleges and university). Each municipality makes their own Official Community Plan, and in theory these comply with the CRD’s Regional Growth Strategy but the approach is piecemeal, consisting of “let’s make a deal” planning on a number of issues. Is this the best possible Victoria we can have for our lifetimes, for our children and grand-children’s lifetimes? We can work together, we can solve our challenges, but today the 13 municipality system prevents us from doing so. 2. When you talk to opponents of amalgamation, what reasons do they give for their opposition or hesitation? Amalgamations in Toronto and Ottawa, Ontario are often held up as the reason we should not amalgamate. Those amalgamations were forced, costly and some communities that were swept up feel they have poorer services, deeper debt and higher taxes. Our Amalgamation is not their amalgamation. How we amalgamate is up to us — how we are governed, by who, and what procedures and policies. It is ours to create and this ability to create our own is enshrined in the BC Community Charter and the Elections Act. 3. What’s the history of “Amalgamation Yes” in Greater Victoria? Prior to the 2011 Municipal Election, some candidates for Council in various municipalities had indicated that they would make Amalgamation a priority if they were placed in office. After the election and 6 months into the job of being ‘the peoples voice’, The Times Colonist reported on ‘top priorities’ of some of the 13 Mayor’s & 76 councillors, not one noted amalgamation. I tweeted this point and my disappointment. Elected City of Victoria Councillor Shellie Gudgeon tweeted back ‘lets go for coffee’. We met and decided to host a community event around the issue of Amalgamation. Shellie very generously footed the bill for the room rental, food, flip chart paper, markers, all the tools needed to have a great community engagement event. With one small ad in the Times Colonist and the weekly paper, Vic News, 150 people showed up to our meeting, Shellie and I were stunned. A number of people from that gathering formed an informal group, we held another community event, another large gathering ensued. It was clear that people were wanting to talk about Amalgamation, to explore it as an option to our current system of governance. This isn’t new. Amalgamation has been a topic of discussion for over 40 years, but how could we move it further than it had been in the past? Unknown to us at the time, other groups like ours were meeting in coffee shops and borrowed offices. Shellie reached out to them, amalgamating the amalgamate-rs. One of the groups was headed up by John Vickers, who is now our Vice President and official spokesperson. Today we are a registered society with 12 board members and over 100 volunteers and deep community support. What is different now than previous efforts? We are striving for community engagement, and in-depth studies on what would be the best form moving forward. To support and provide confidence to Mayor’s, Council and the Provincial Government in moving forward with Amalgamation exploration we are asking that a non-binding question be placed on the ballot of the 2014 Municipal Election so that the people can democratically demonstrate their will. That’s the difference from previous efforts, community engagement and a non-binding question on the ballot. 4. The current “Amalgamation Yes” initiative in Greater Victoria started as a citizens’ initiative. Is that important to you? Do you think a grass roots initiative has a greater chance of success than one led by a political body? If a political body were leading this charge, fostering community engagement and putting the will of the people first and foremost I personally would have jumped on their bandwagon at the get-go. The catalyst for our group was a City Councillor, an elected official. To take a page from that City Councillor, Shellie Gudgeon, ‘we are stronger working together’ and she is right. We’ve had many elected officials encourage us and we in turn encourage them. The Greater Victoria Chamber of Commerce has a policy statement on their website regarding Amalgamation – they are advocating on behalf of their business membership for a forced Amalgamation. Our research indicates the most successful amalgamations are those that were not forced, but we regularly have discussions and update them on our efforts. We wish to work with all Chambers, individuals, business owners, organizations, political parties and elected municipal officials to move forward, with our community, to achieve accountable, cost effective governance in our region that reflects the will of the people. 5. In a larger, amalgamated city, how do you go about ensuring that citizens still have local influence over their neighbourhoods and communities? Amalgamation can be any form we choose, we can look to several cities and their amalgamation, adopt best practises, we can look to those communities who wish theirs was different and learn from them. Amalgamation in our region is not defined, it could be 6, 3 or one city, it could include the CRD in its current form, or, some other form or not exist at all. This is the exciting aspect of where we are headed, it is up to us to decide. We have to get that first non-binding question on the 2014 ballot and we have to have a strong voter turnout and a stronger ‘Yes’ before we can move forward. 6. What are the next steps and how can citizens in Greater Victoria get involved? Great idea for, and execution of, post, Lorne. And, thanks to Susan for her clarifying answers. She certainly has the broader community at heart. As I read this post, I was thinking of the word ‘amalgamation’. It’s an interesting word. It tastes a bit of bigger is better… It has almost a corporate feel to it (at least to me, it does) At the same time, I suspect most of the people on the ‘Yes’ side are supportive of local, collaborative, creative… (good!) as Susan’s answers seem to indicate; eg “Amalgamation can be any form we choose…”. Words matter. Maybe a good reframe is in order? I sense there are many other successful organizational models, and words, to work with. I think you are right, Ben, about the word. It does ring–bigger is better. It receives a cringe from the people who believe strongly in ideas such as organizing around bioregions. My sense is that you are using amalgamation as an organizing word but it might be putting emphasis on the wrong aspect of your plan if you want broad appeal. Allegiances to municipalities are micro nationalisms and imagining different borders becomes an issue of identity–this is big stuff. 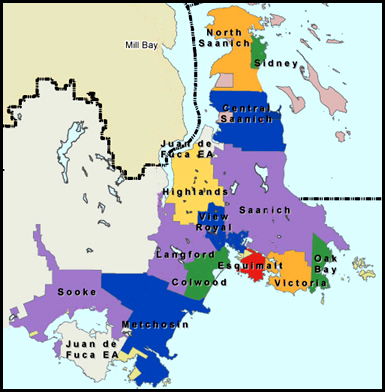 I live in North Saanich and the liberal-progressive- left-green type people, who I think would be interested in ideas about reshuffling boundaries to fit with a more natural rather than super-imposed social/cultural/economic flow, often refer to Sidney as a looming threat to NS’s character. There is a lot of work to do and I commend you all for raising this issue in such an intelligent way. I will stay in touch. There are possible benefits from amalgamation, and it’s great to think about them, but there are definitely drawbacks as well, and it would be irresponsible not to think about them. However, we don’t need full amalgamation to take advantage of some benefits, so why not start with specific issues to consolidate services where they would be most beneficial? That way we can avoid the drawbacks of complete amalgamation. We already have the CRD, which is amalgamation-lite, and if you ask people if they’d like a bigger, more powerful CRD, I think many would say no. That’s what complete amalgamation would do. Yes, amalgamations in Ontario have failed, and there’s no reason to think that doing the same thing here in BC will magically produce a different result. Victoria and Esquimalt already have amalgamated police forces, and there are often disagreements about where police are patrolling, and whether Esquimalt is getting enough for their money. If there was one police force for the entire CRD area the problems would only be multiplied. Susan said in the interview that the 13 municipality system prevents us from working together to solve our problems, but it’s simply not true. We have the CRD and we have shared resources already. If shared fire departments would be less expensive, or more effective, we don’t need to amalgamate before we can discuss the possibility of sharing services. The key difference though, when we have many municipalities, is that when it doesn’t make sense to share a service, we don’t have to, and when it would make sense we can. Under amalgamation, we would have to share services whether it made sense or not. Hi Daniel, thank you for your thoughtful comments. Please keep in mind the question we are asking to be placed on the ballot for the 2014 municipal election is non-binding. I agree, there are pros and cons to any amalgamation, just as there are with our current system of 13 municipalities to which 360,000 people call home. As we all know amalgamation has been a topic of discussion going on 40 years. Lets get the question on the ballot, there is nothing to fear in a non-binding question and a non-binding answer. If the people provide a resounding yes, then the community consultation and research begins. It is in that community consultation and research that solutions will rise, solutions that may or may not include amalgamation. Without the question on the ballot there is nothing to compel our municipal politicians one way or another, we simply carry on as we are today which to many, is not sustainable or acceptable. The key thing about consultation and discussion is to listen, not just speak. I have not voiced any opposition to placing a question on a ballot, so I don’t know where you’re getting that. You haven’t responded at all to any of the specific points I made, and I find myself wondering if you’ve actually read what I wrote. Would you kindly read what I wrote and actually respond to the specific points? As to the points you make in your post, there’s no reason to wait until after a vote to begin discussion, research and consultation. Why not start right now? If the discussion has been going on for 40 years, perhaps now is the time to present citizens with specific plans of how amalgamation can reduce costs or provide more effective services. Small, specific goals are more likely to be achieved than a large, vague goal. For example, if sharing fire services really does make more sense, the amalgamation group should write up a proposal about how fire halls can serve the surrounding area rather than only their own municipalities. With a specific plan like that, it would be much easier to evaluate whether it would be more effective or less expensive, and far easier to convince city staff and counsellors to get on board. If that plan succeeds, then it becomes much easier for future efforts. Rather than asking people to compel our politicians to amalgamate, perhaps we should be asking our politicians to look at ways they can increase cooperation and shared services that already exist to create less expensive or more effective services. If city counsel or staff of any municipality were able to announce that they had reduced costs by sharing services, they likely be very happy to do so, and it wouldn’t even require a ballot initiative or amalgamation. Hi Daniel, I and others involved are “listening”. To engage we offer you and the community a few options, one is visit our information centre at 577 Pembroke St. it is open every Wed. and Saturday 1-4. At the centre you will find research, studies graphs, background information created by the Amalgamation Yes team, and you will find people to engage with. Also, there are various upcoming events where you can engage with others, for example this one organized by the Community Development Committee of the Downtown Residents Assoc. – a public forum, the focus will be on the question of regional amalgamation. Confirmed speakers include John Vickers of Amalgamation Yes, Victoria Police Chief Jamie Graham, and author Gaetan Royer. Presentations will be followed by audience comments and questions. Once the formal event wraps up, speakers, attendees, and journalists can mix and continue the discussion in the Victoria Event Centre’s lounge. Bar service will be available throughout the evening to those who are 19+ with 2 pieces of ID. September 28, 2013 http://www.timescolonist.com/opinion/editorial-report-won-t-change-minds-1.641497. Again, thank you for providing your opinion. Susan, I’ve listened to (read) your statements, but you haven’t listened to to what I’ve said. Hi Daniel, it would be most helpful if you could define what you mean by ‘listening’. Thank you. Hi Susan, when I say listening I mean reading, thinking and possibly responding. In a two-way conversation a person does both talking and listening. I read and thought about what you’ve written. I’m just asking that you also listen (or read) what I’ve written, think about it and respond to some of the points I made, instead of ignoring what I’ve written and explaining your point of view over again. For example, I read what you wrote about putting amalgamation on the ballot. I thought about it, then I wrote a response to that. As I said, I’m not opposed to a question being added to the ballot. In fact, in a democracy, maybe a lot more questions should be added to ballots. As for the question of amalgamation on a ballot, it’s great to get people to think about it, and maybe it could create some positive change. I’ve already written my thoughts in couple posts above, so there’s no need to repeat myself. As for what Ben and Sylvia wrote, I agree that amalgamation might be the wrong word. Something along the lines of “municipal cooperation” might attract broader support.